Last month I decided to challenge myself to create layouts using all ten of the July PageMap sketches. I enjoyed it so much that I decided to do it again with the August sketches. 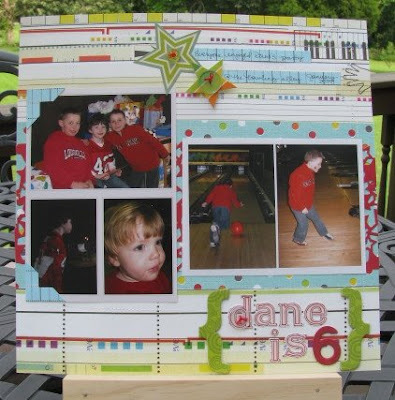 I enjoyed using these "new to me" Sassafrass Lass papers on this page about my nephew's birthday party back in January. I used pop dots under the stars and added some clear buttons for dimension, too. This LO is for Kevin's album. I cheated a bit and used some photo collages on the page. Another Kevin LO - he loves Scout! 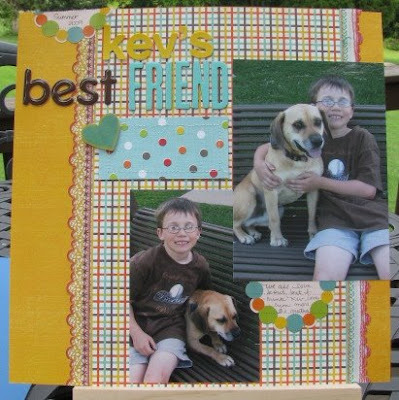 "Kev's best friend" uses Sassafrass Lass papers, too. I altered the sketch to make it 12x12 and also added an extra photo. I even pulled out my sewing machine for this one (to stich around the dot rectangle). My July kit from Personal Scrapper was a bit neglected last month. I loved the Fancy Pants papers, but was too busy with the boys to put it to good use. I used four different sheets of patterned paper to make this page. The sun was actually cut from the base page (which was going to be covered by a photo) - I raised it up with pop dots. I also cut the waves from another sheet. Sometimes bling is hard to use on boy pages, so I used a lot of it here to look like water droplets. 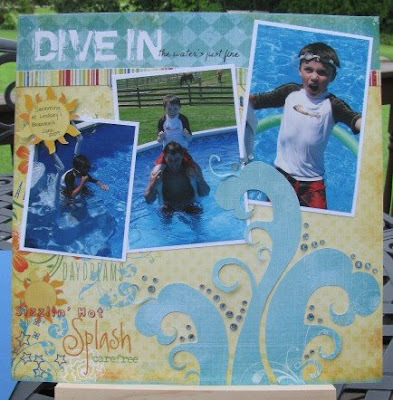 These fun photos are from earlier in the summer at my sister's pool. Even though I didn't have many pics from one tournament Kevin participated in, I did have a story to tell! Loved using the journaling card to get this memory down. The tournament was called off and we were not happy about it - or happy about being charged $3/person to be told it was called (and not to receive our money back!). This photo of Kevin was actually snapped at one of Blake's tournament games, but Kevin was in uniform. I decided to enlarge the photo and give an overview of his season and the positions he played. Aside from sports, I realize another topic I tend to neglect is Cub Scouts. This January both of the boys were awarded Catholic Religious Awards in Louisville. They had to work really hard to meet the requirements. The ceremony was in Louisville at a beautiful historic Cathedral. I used the K&Co. Cub Scout paper line and kept this LO simple since the background in the photos was so beautiful. More of the K&Co. papers were used to document Blake's awards at the annual Blue & Gold banquet (breakfast). The paper had a lot of detail, but was "flat." I added some dimensional accent (glaze) by tracing over "cub scouts" on the patterned paper. It gives a neat raised up effect. Finally I tore into my August kit from Personal Scrapper. I LOVE, LOVE, LOVE the Scenic Route papers this month. I had a silly photo collage of the boys and their cousin Dane playing football. The photos were a little dull, so I loved using all these colors to liven it up a bit. Blake worked really hard on his career project for school this spring. I only have the one photo of him with the finished project though. I really liked using this sketch for this single photo - I loved using all the different Scenic Route patterns. It will remind Blake that when he was 10 he wanted to be an architect. I wonder how many times his career goal will change. 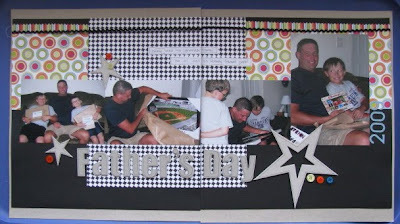 This last LO uses pics from this year's Father's Day. 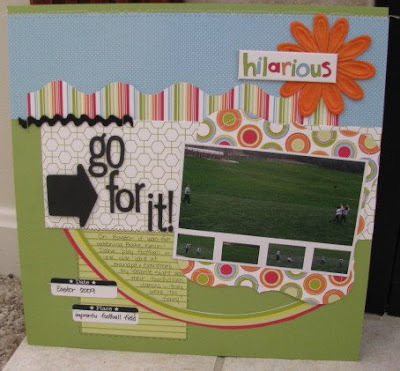 I also used the August PS kit with this one and added naked chipboard by Scenic Route and Fancy Pants. I outlined the chipboard letters with pen. Now I'll patiently wait for the September sketches! LOVE LOVE LOVE the new pages. Esp. the Father's Day one!!! 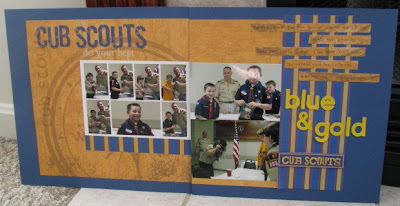 Great job finally documenting cub scouts!! Amy, you ROCK! I don't know how you find the time! Awesome layouts and I like the challenge of using the Pagemaps! You are my idol! How do you do it? I would love to get in all the Page Maps. You did a great job. I admire you for cutting out those waves on the swimming page. And LOVE the architect page about Blake. You are such an inspiration my friend. Wow! These are really great I love several of them and don't think I could pick a fav. What a great challenge to yourself. Maybe I should try something like that. I love them! Great job! The all star is so cute! Great job finding time to get all of them done! Wow!